Another Flagging New Year is in the books! The fourth edition of the annual tournament is over, as the Aberdeen Oilcats lifted their first trophy at the event! Both days were frigid affairs, with rain also interfering with gameplans on the Saturday, but there were plenty of entertaining games for us to digest! On Saturday, Group 1 was topped by the Wild Hogs, who entertained onlookers with their impressive option offence. They overcame the Glasgow Hornets 18-14 in group play, as they were the only perfect side going into Sunday. The Hornets took care of business to finish 3-1 and advance to the Gold bracket. 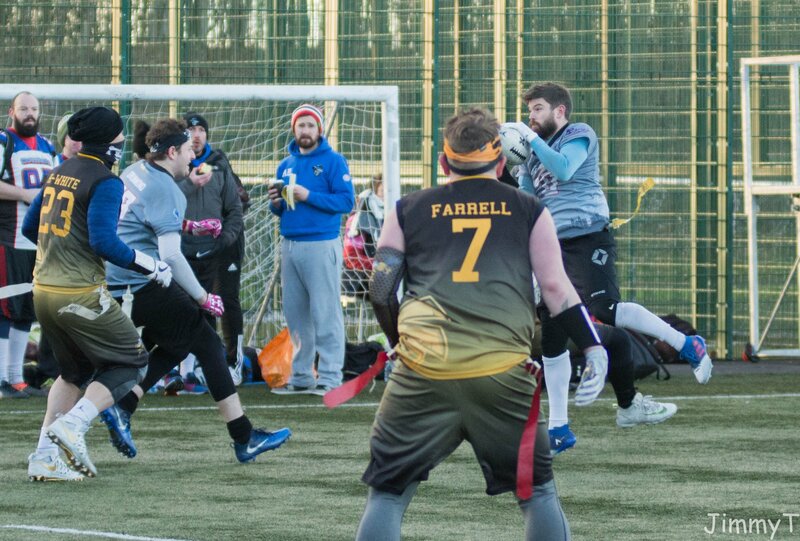 Elsewhere, the Leeds Samurai and Carnegie football side entered the Silver bracket, while the Balerna Beasts, in their first ever action, were unlucky to end up in the Bronze tier. Group 2 had far less clarity, as the top two teams, the Grangemouth Broncos and Vienna Spartans, played out an awkward tie, 27-27. Both teams advanced to the Gold bracket with 3-0-1 records. The Edinburgh Outlaws continued the theme of tied games as they played our a draw against the Craigavon Cowboys. Their sole win against the Cougars was enough to put them in the Silver Bracket, along with the Coventry side. The Cowboys were the Bronze bracket participant from Group 2. In Group 3, the Oilcats turned up with a full strength team, and were ready for the fight. The Victoria Park Panthers and Purmered Barbarians were also in the mix for the Gold bracket, but in the end, points differential alone resulted in the Barbarians dropping into the Silver tier, while VPP and Aberdeen would test themselves in the Gold bracket. The Reckless Russians picked up a win, but that wasn’t enough to keep them out of the Bronze bracket, while the Comets joined the Beasts as the only team without a positive result on Saturday. In the Bronze bracket, the Comets were boosted by the return of David Pasnik, who earned himself an Team of the Tournament award for his efforts! The Comets went undefeated on day two. The Reckless Russians had Cammy Wilson to thank for an upturn in results, as he too picked up Team of the Tournament honours. The Russians only fell to the Comets on day two. Meanwhile, the Cowboys defeated the Beasts to ensure they didn’t go home with the wooden spoon. The Leeds Samurai got off to a hot start, defeating the Purmerend Barbarians in their first game of the day. Liam Craddock was excellent on day two, as his performance at safety earned him an Team of the Tournament medal, and the Samurai showed their class by going undefeated in the Silver tier. 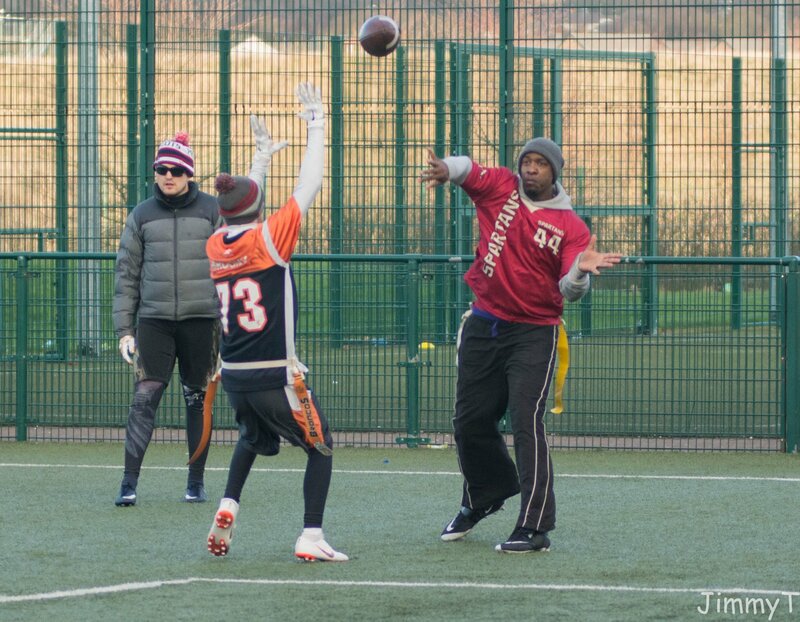 The Coventry Cougars, Purmerend Barbarians, Edinburgh Outlaws and Carnegie Flag Football all traded wins and losses on the second day of action, but none could topple the Samurai. Edinburgh, Carnegie and Purmerend all provided us with members from the Team of the Tournament, as Jamie Archibald represented the Outlaws, while Brandon Lamb had a fine weekend suiting up for Carnegie. Davey Kolhoff was one of the international players who got into the Team of the Tournament, impressing onlookers for the Barbarians! The round robin format of the Gold Bracket gave us some wildly entertaining games, as the Glasgow Hornets emerged undefeated into the final. They had slim victories over the Grangemouth Broncos, Vienna Spartans and Wild Hogs, avenging their prior loss. They comfortably defeated the Oilcats and VPP in group play by multiple scores, and looked in prime position for their first FNY trophy. Meanwhile, the team they would face in the final was far less clear. VPP finished day two without a win, despite a strong Saturday. The Wild Hogs were looking to build on their perfect Sunday but started poorly with a loss in their opening contest. Wild-Hog-for-the-weekend Malik Helm earned himself a Team of the Tournament nod, but there was plenty of talent to choose from in the Slovenian side. On Sunday however, they only managed wins against the Oilcats and VPP, as they went 2-3 on the day. The Spartans failed to improve on their 4th place finish last year, as they finished just outside the medal places again, despite the excellent play of Devin Adkins, who was voted into the Team of the Tournament. They were ousted by the Grangemouth Broncos, who despite finishing with the same record as the Oilcats, did not progress to the final after a head-to-head loss to their HNC foe. That set us up for a final between the Aberdeen Oilcats and Glasgow Hornets for the title! The game was a tense contest, as missed opportunities and fortunate (or unfortunate!) bounces told the story. A quick score by the Oilcats was the only notable action in the first half, as the Hornets failed to punch the ball into the endzone. A batted ball nearly resulted in a Hornets interception, but the ball bounced off the defender’s hands into the ground. The Hornets did get on the board after the interval, but an excellent toe-tapping grab by Gary Elliot gave the Oilcats the lead again. The Hornets turned the ball over, and on Aberdeen’s 3rd and long, a deep ball that looked destined to be intercepted ricocheted off of the Hornets defence and landed in the hands of Greg Sim, who raced for his second score of the game. With barely any time remaining, the Hornets roared back with a final score to being the game within 6 points, but the Oilcats were able to run out the clock, and picked up their first win over the Hornets in some time, 20-14! Greg Sim was the standout performer in a cagey final, as he tallied two scores and an interception on the biggest stage. Despite the loss, the Hornets had three members of their squad in the team of the tournament, as Richie Moore, Nicholas Farrell and Callum Stopani were rewarded for their efforts. Here are the final standings for Flagging New Year IV! We already can’t wait for next year – which is bound to be warmer! Headline image courtesy of Jimmy Thomson.